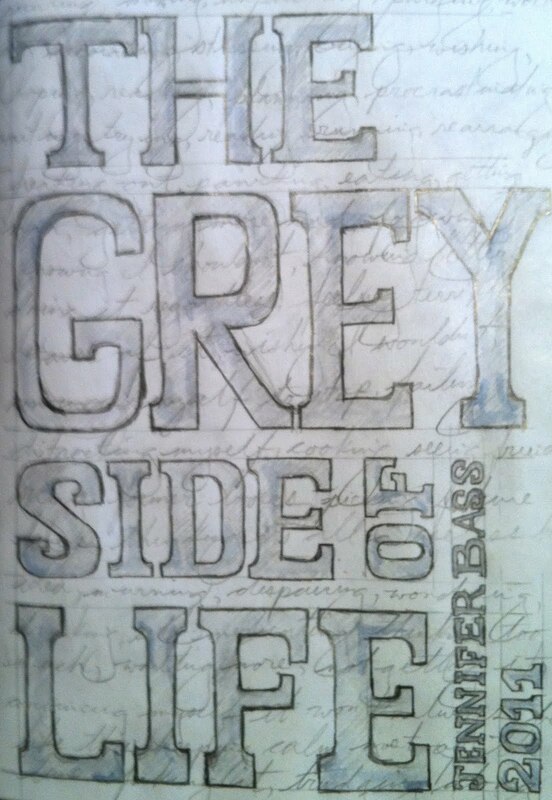 Here's the title page. It's just pencil, with a tiny bit of watercolour. I'm trying to retain the sketchy look, so I haven't erased any of my guidelines or the like. 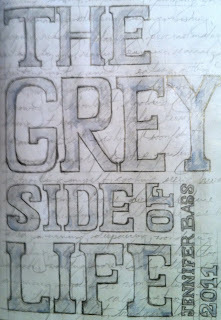 I just drew and shaded the letters, wrote a bunch of words that describe my grey life at the moment (good thing the photo's a little fuzzy!) in the background, and added some colour. Well, navy blue in a really light wash, for a bit of interest. From here I had thought to start documenting 'grey things', like my many grey dresses and shoes (I love grey) or something along those lines. 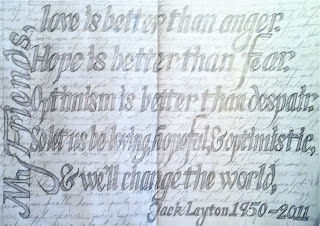 However, on Monday Jack Layton died, and I decided it would be a good subject. For those of you reading this who aren't Canadian, Jack Layton was the leader of the NDP, the official opposition party. He was a very well respected and inspirational leader to many people, and not just his own party, and as such was given a state funeral and motivated spontaneous memorials in major cities across the country. Take a look at the photos of Nathan Phillip's Square in Toronto, the chalk messages are beautiful, and in part a reason for sticking to the same style as the title page, a little in order to mimic the memorial. 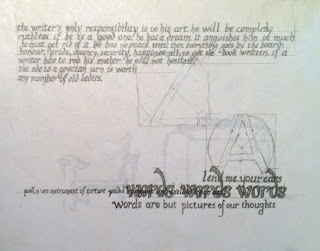 The words are from the letter Jack wrote to Canadians before he died. I used the memorable last words for the large text, and the background is the paragraphs addressed to Young Canadians and All Canadians. I ran out of room just before the really political statement about the NDP at the end, which is kind of perfect for my purpose, keeping it a memorial rather than a political statement. I made the letters just a little too big, so I don't have enough of a margin between the 'My Friends' and the rest of the text, but other than that it turned out very well. I'm really pleased with the layered texture, and pleasantly surprised by how much depth can come with just a grey pencil. 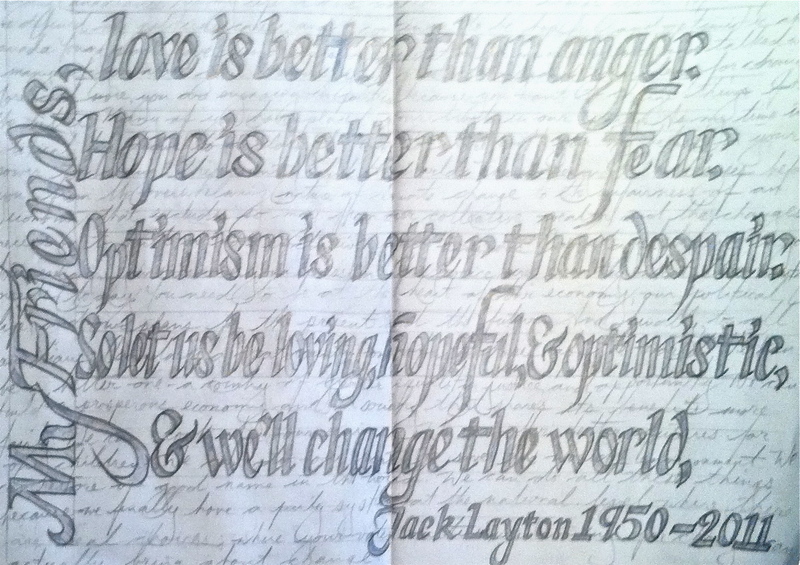 Love the Jack Layton Quote J! Its looks sweet!